The Soot Eraser Works like an eraser, absorbing smoke residue, soot, fly-ash and dirt. Use It completely dry! No scrubbing, no mess, no solvents, no cleanser! 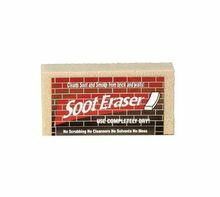 Made from a non-toxic 100% natural vulcanized rubber, the soot eraser works on most surfaces including: brick, mantels fireplace hearths, woodwork, window blinds, window shades, painted walls and most wallpaper.